Home » »Unlabelled » US military mission in Iraq. US military mission in Iraq. 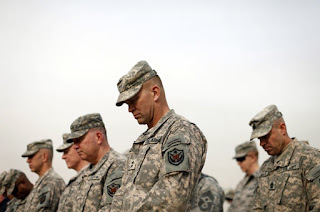 Military personnel lower their heads during ceremonies of the encasing of the US Forces Iraq colors, in Baghdad, Iraq on Thursday, Dec., 15, 2011. The ceremonies mark the official end of the US military mission in Iraq. It is harder to remember now, with joblessness dominating the presidential debate and souring the public mood, but it was not long ago that the Iraq war consumed about everything. In a new Associated Press-GfK poll, about half of those surveyed called the Iraq war highly important to them. It placed lower in importance than all but one of 14 current issues. 'It's understandable that he's trying to bring it back to the forefront of the public consciousness,' said Ole Holsti, a retired Duke University professor who has written a book about American public opinion of the Iraq war. Obama's approval rating on handling the situation in Iraq has been above 50 percent since last fall. In the new AP-GfK poll, he has ticked up four points since October to 55 percent.